I read a thoughtful post by Dan Slee last month about why he won’t join a professional body; in his case it was the Chartered Institute of Public Relations. It was quite a telling post as it fell hot on the heels of the CIPD’s HRD 2013 event and I had a few members of my PLN querying if I was at the event. I wasn’t because I gave my CIPD membership up a few years ago. Here’s a few reasons why I’m no longer a member. I am not as critical of the CIPD as many others have been in the past, but I’m not sure they have a relevance to me in a specialised L&D role. The CIPD sets great store in suggesting that their qualifications are valued by employers. From a L&D perspective I’m not sure that’s quite true. The range of learning accreditation that is now available – NVQs, PTLLS, etc – means that a basic CIPD qualification isn’t a gold standard any longer and the expectation of a CIPD qualification as an essential requirement for many L&D roles is no longer the case. Another lack of relevance is how the CIPD website sells me professional recognition as a key driver for membership. I’ve a much higher professional reputation since I LEFT the CIPD than when I was in it. Access to information on “…pensions and auto-enrolment guidance, HR and business news, employment law updates, comment and insight, journals, company reports, country profiles, development tools and more.” There doesn’t seem to be a lot there for a L&D professional. If I was a generalist (or indeed other specialist) HR then I can see value in that information. However, for a L&D professional? Part of the subscription would go towards a copy of People Management magazine – a printed version of a website which has published 3 stories about L&D to date in May. Surprisingly, I’d read about the John Lewis story 2 days before the CIPD published anything on their website by having RSS feeds to national newspapers. The CIPD tells me that I can save £499 on a range of L&D support if I am a member. The site doesn’t mention that an outlay of over £5k would be required to achieve these savings. I work in local government which is facing some of the toughest budget pressures of any industry. Do I really want to lay out £5k for L&D activity that I can get, in many cases, for less than the discounted price? The change from knowledge workers to skill workers and approach to learning in the workplace doesn’t seem to have filtered into the L&D offer from the CIPD yet. There’s some fabulous looking courses, classes and programmes on their website at prices that make my toes curl. Being a member of the CIPD gives me networking opportunities through local branches. Not being a member of the CIPD I can still use LinkedIn, Twitter, Pinterest, WordPress, Bebo, Ning, Google+… I know the CIPD run a range of events where members can meet – HRD 2013 being one. The feedback I’ve read and heard from people who went was, the most part, underwhelming. That may be confirmation bias on my part – more likely the people who got the most from the event aren’t in my circles of contact. Maybe I’m wrong. Maybe the CIPD is the happening place to be now. The Chief Exec Peter Cheese said in January that he had new strategic imperatives. I assume they’ll take time to work their way through. What do you think? Is the CIPD good value? Am I wrong to dismiss membership as a L&D specialist? Comments, as always, very welcome. Hi Andrew – nothing like a few jabs at the CIPD to draw a few comments. It’s irresistible! Like you I declined to renew my CIPD membership several years ago, even though my employer would happily pay for me. I enjoy laughing out loud at the regular “opportunities” I receive in the post to rejoin the CIPD and have my professional achievements “officially” recognised. Annoyingly though I think there probably is still value in terms of recognition with many employers. The reason for that? Many, if not most L&D teams, reside within the HR division. That inevitably, means the decision to hire you, or not, comes back to someone with a strict CIPD upbringing. So not being part of the gang could be a disadvantage. I still won’t renew on point of principle for all the reasons you outlined above.They simply have no relevance to our profession. I speak as a member, active too as a newly elected Branch vice-chair, regular speaker and blogger and contributor to past and present campaigns for CIPD. So I might be biased in the opposite direction from you. 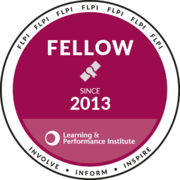 I also speak as a passionate learning professional firm in the belief that L&D /OD is the yin to HR generalist Yang for work, people and success. I am realistic enough to agree with much of what you say here though. My take on being a member and an activist is mine so I choose to be part of the membership as much as yours is not to be. I respect that and even more applaud you for calling this out as you have. CIPD appears to agree with you now and certainly Peter Cheese does as he’s said so on numerous occasions. CIPD needs to reconnect and establish a better deal and dialogue with learning professionals. Collaborative ways seem key in future business successes and from my own personal experience of people inside the CIPD, I’ve been helped enormously by them and always felt my membership was great VfM through those collaborations. I acknowledge many won’t have had the same experiences though which is something you rightly point out. So what to do. my thoughts. 1. Keep your focus on you and prompt dicussions to see if there is an opportunity to restore some relevance and validity for learning professionals via posts like this. Active debates like this can effect changes. 2. Take a wish list approach and follow this post with a bit of an Appreciative Inquiry dream state. What WOULD be the perfect set of circumstances to give you a choice to reconnect and maybe re join. You never know what might happen when you set out an alluring proposition others would rally behind to force a member organisation to reconsider its proposition to a large and valued part of its professional cohort. 3. Stay as is, which clearly works well for you and many others. Professional membership bodies aren’t for everyone. No judgement on my part of people in or out of the membership equation. 4. Join rival bodies. LPI, ITOL, ILM, ICF, EMCC all have something to offer. I can vouch for most of these and they care as much about what they stand and offer benefits that may be more akin to needs. I am a member of some but not all these incidentally. 5. Come closer and have more dialogue yourself with CIPD without committing to rejoin – lend some shaping thoughts. if nothing comes of it, “they” will have had their chance. Again, I applaud your position and you’ve backed up all your points with non-emotive facts. I sense this one could run on for a bit and that may well be just what is needed. Most of all you appear to care about your professional pursuits deeply and that is something to genuinely admire. I hope something really positive and productive comes from this and my comments have helped your thinking. I wholeheartedly agree with your sentiment here. I’m the Capability and Career Development Director for CIPD and joined 10 months ago. My role is a new one, and recognises Peter Cheese’s absolute commitment to tackling the very issues you’re calling out. The CIPD has done a lot of good stuff in the 100 years since it came into being – but we’re not doing enough for L&D, and we need to get better. I have an L&D background and had long felt, like you, that the CIPD weren’t recognizing my profession as equally. We have been working really hard to turn this around. So far we have rewritten the L&D areas of the Profession Map to make them more relevant; we are revisiting the qualifications for the same reason; we’re conducting research to make sure we’re answering the real questions L&D professionals have for us; we’re looking at more flexible and appropriate routes to membership for L&D and other professionals; and we’re also exploring some more radical questions to ensure we’re building the best communities L&D want and need – and not necessarily always looking to old answers like membership as a holy grail. Those are big things, and some of them will take time. Some of them won’t, though. And we’re also going to do some little things straight away – like the simple but I hope symbolically important decision to rename HRD to something that actually makes clear it is for L&D! We’re passionate about getting this right and really recognising, supporting and being as relevant for L&D and all the other business disciplines that go to make up the whole profession as we can possibly be. I’d really welcome yours and others ideas and thoughts to make sure we’re on track and make the difference we need to. As Perry says, please do tell us what great looks like for you. We want to get this right, and demonstrate that we can be agile and surprising in equal measure. Please do stay in touch. We’re interested in everything you have to say from outside. And maybe one day we can give you enough reason to come back in. Very interesting piece, thanks for sharing. Personally I have never been a member of CIPD but always had a niggling feeling that I should be. I’ve come from a trainer background to my current L&D management position without much involvement in the HR side of things and I don’t ever recall being advised by previous managers that this is something I needed even though some of those themselves were/are members. Perhaps CIPD need to do more to promote itself as an organisation with an arm specifically supporting those in the L&D field? In terms of research informing L&D I’d say it is way ahead of its professional institute rivals. The Steady State to Ready State research under John McGurk which provides insights into cognition, neuroscience etc is to be applauded. A recent blog that I think is worth sharing across the wider OD team. I would like to mention as well the terrible customer service that they have. I am waiting for 6 months to receive my certificate and I am tired of calling and chasing them when they don´t do nothing except blaming other departments about my situation. So disappointed!!!! We pay a lot for the certificate and after they don’t even deliver their part of the service properly. I would echo Claudia’s comment. I finished my Level 7 qualification more than 18 months ago and am still chasing for both my overall grade, and for my certificate. For such an expensive qualification, I think this is appalling. The service I have received from CIPD about this matter has also been extremely poor. I have been transferred between departments, with each transferral adding on weeks to the process, a number of times. There has been no concrete plan articulated to me about how they will remedy this problem, and no one has apologised. I know several others from my intake who are in a similar position. I’m really disappointed in the CIPD and how they manage their processes. Sadly, I will join the short of disappointed professionals. Having over 20 years of HR experience, with my most recent HR work being within a fast moving technology company in the UK and US, I was informed that my experience did not qualify me to take the experience one route, not even at the Associate level. The questions asked were not inclusive to assess skills in smaller, modern companies but appeared tailored to HR within public sector or large corporates. There was no flexibility in understanding modern work places and criteria were old fashioned and not adaptive at all. Quite shocked by the quality of the telephone assessment, it was like speaking to an HMRC official !